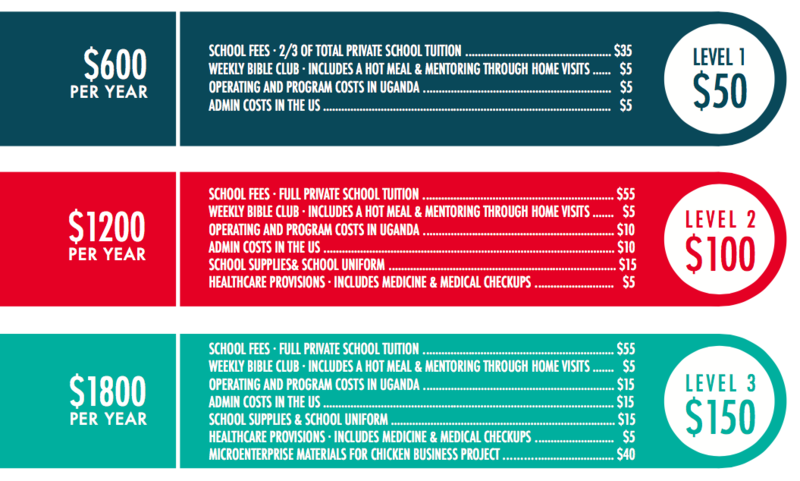 Help a Ugandan child receive an education, start a microenterprise project, and be discipled! Click here to sign up for monthly sponsorship and select your sponsored child. You can assist a Ugandan child in desperate need that simply cannot afford to go to school. In addition, many children risk being pulled from school if they cannot pay school fees the following term. Help ensure that these children receive an education. We currently work in the Wakiso and Mityana areas of Uganda. OWNERSHIP – We create ownership in the sponsorship program through microenterprise. Through this project, families are able to rear chickens and sell eggs to earn a small income. Microenterprise encourages the child and their family to be self-reliant and to feel empowered. They are contributing toward their family’s financial well-being and contributing toward their child’s future! SAFEGUARDS – The families can use the money from the microenterprise project to safeguard against emergencies and invest in their future. For example, if there is a health emergency in the family, money can be used from these funds. INVESTMENT – Microenterprise builds investment into the child’s future. We hope that some of these earnings will be used toward college, future capital into business, and/or for unplanned emergencies. Each child has three sponsorships total! Choose a level of sponsorship ($50, $100, or $150/month) and see the benefits below that the child will receive. Sometimes a child already has one or two sponsorships filled, hence you have the opportunity to fulfill their second or third sponsorship! We encourage sponsors to make a long-term commitment to their sponsored child to ensure that they receive timely benefits until they graduate from secondary school. You can create a special bond with your sponsored child and make an emotional impact in their life. And we hope you do! You will receive three letters and an updated photo of your sponsored child each year – mailed to you. You also have the ability to write letters to your sponsored child and of course to visit them through one of BOHAM’S mission trips. Click here to download more information about sponsorship.